Last Friday was a night for the arts. Despite sheeting rains, throngs of Rafflesians swarmed the amphitheatre in anticipation of The Poetry of Movement, while Raffles Photography Society’s Anamorphosis and Raffles Art Club’s Up had taken over the adjacent walkways. 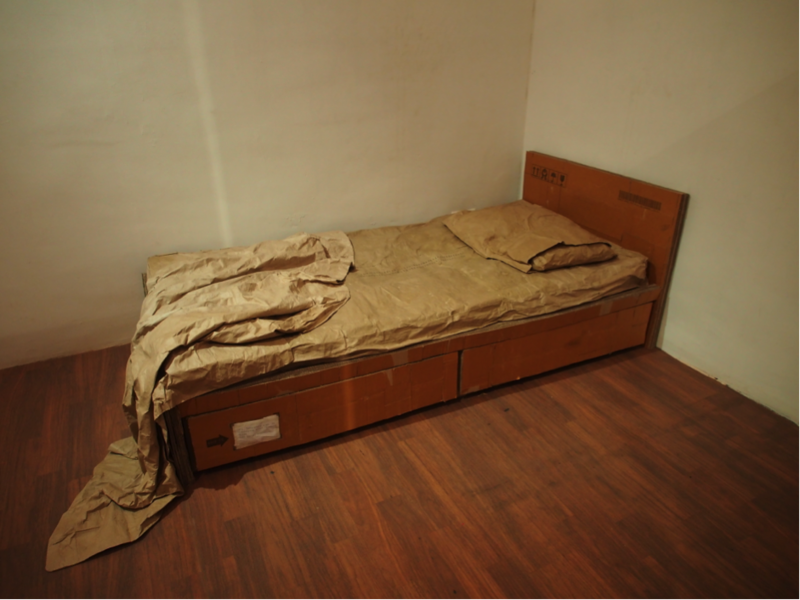 In a corner of Block A, a warm glow unfurled from the usually disused art exhibition space. 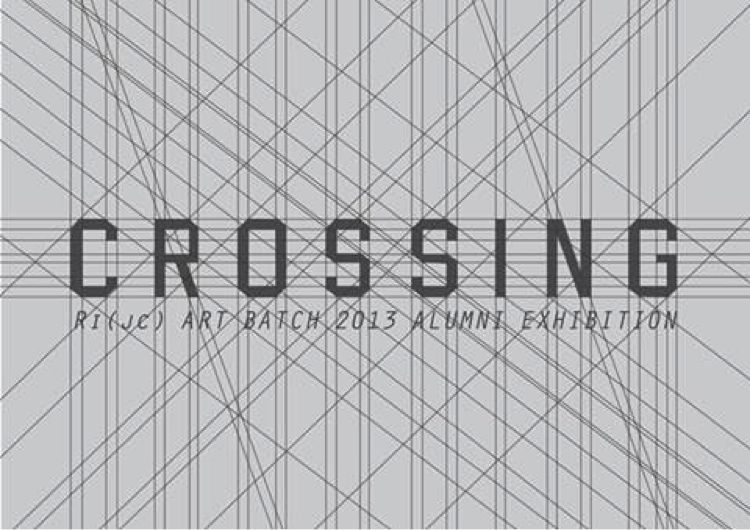 This was Crossing, a joint showcase by the most recent batch of graduated art students encapsulating their progress at a point when they are about to embark on their respective university educations. 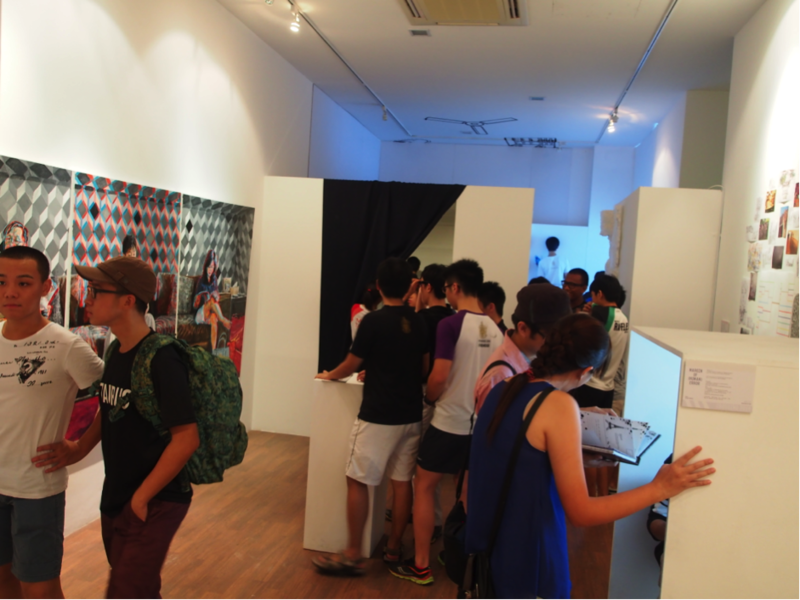 Seet Yun Teng articulated its significance thus, “For us, this showcase tracks our progress, letting us see where we are now. It’s a milestone in our lives, tracking how far we’ve come and where we’re going, which is very important especially for those of us who might not be going down an art path in future. For our batch, it’s like closure.” Of the ten students, four will be attending a fine arts education, including Yun Teng and William. Two others hope to study architecture. Pursuing something as demanding as art demands a great deal of passion, which these alumni did not lack. 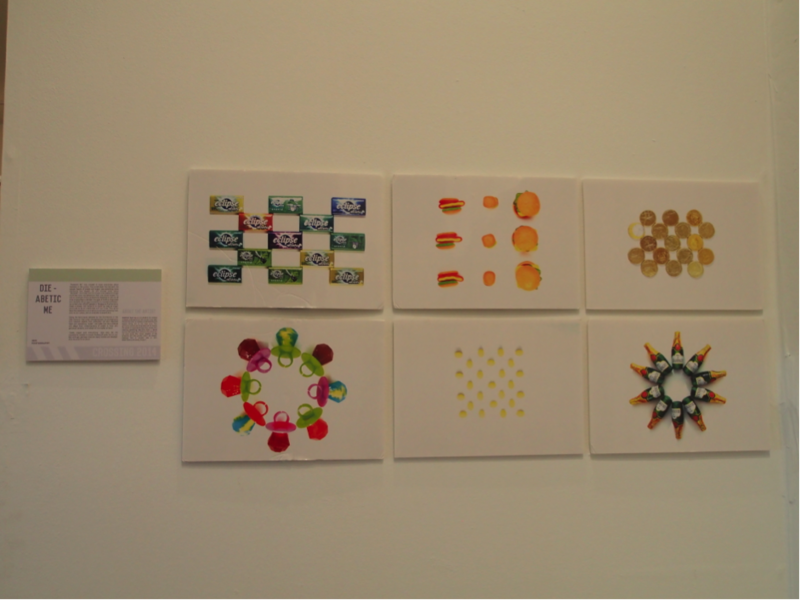 Asked what her most valuable takeaway from JC art was, Yun Teng said, “What I like is that art here really opens the mind up and encourages experimentation and independent work, which you don’t really see in other schools […] Art here showed me that it is possible to do art beyond JC. There’s a perception that it’s not possible to study art at a higher level, but my time in art convinced me that this is really what I want to do for the rest of my life.” Yun Teng is currently interning at the National Arts Council. William’s evocative installation was a heartfelt commentary on the feeling of displacement from being in a foreign country, and parental love. 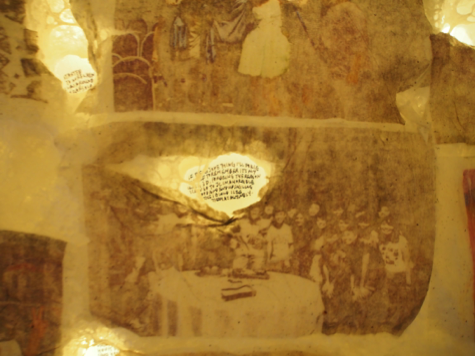 A closeup of one of the hundred memories, printed on tissue paper, making up Seet Yun Teng’s coursework. 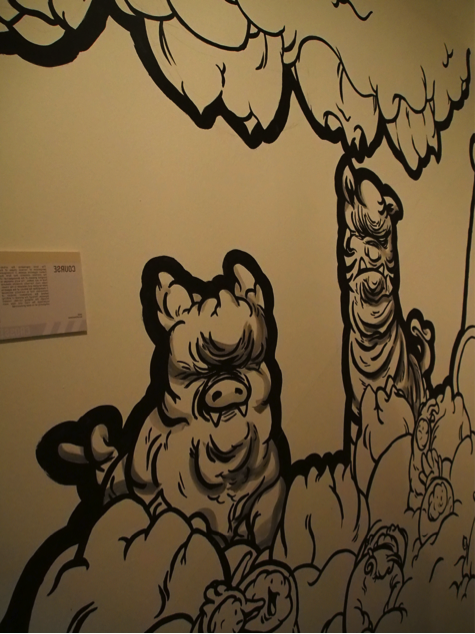 Tan Yan Yong’s coursework, entitled Course, was a maze installation featuring quirky larger-than-life illustrations of the inhabitants of the gastrointestinal tract. 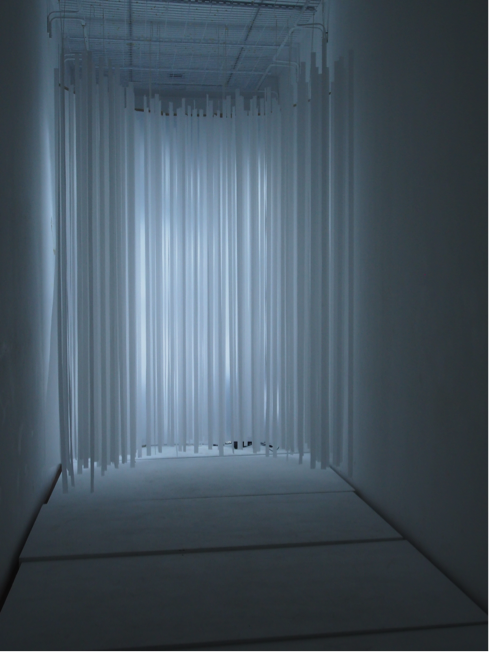 Chia Yu Xuan’s installation drew on the properties of temples to create an immersive spiritual experience. In addition to their coursework, each artist also displayed samples of work they have done since graduation, which were more experimental in nature. William featured Clouds ‘n’ Thoughts, a popular ongoing instagram-based project dedicated to illustrating pithy quotes that anyone can submit here. Another student, Ahmad Nazaruddin, submitted a glass and charcoal-on-paper work addressing the prickly subject of religion. Eugene Tan, whose trompe l’oeil triptych oil painting drew considerable interest from exhibition-goers, also submitted a photoseries exploring the sinister nature of seemingly innocuous candy, aptly titled Die-abetic Me. Having been liberated from the constraints of the A Level system, each of them evidently seized the chance to explore their interests and take more risks. When comparing each artist’s past courseworks to their present experiments, one can clearly see how their skills and conceptualisation abilities have progressed since their graduation, as well as their flexibility in dealing with a diverse range of topics of interest. 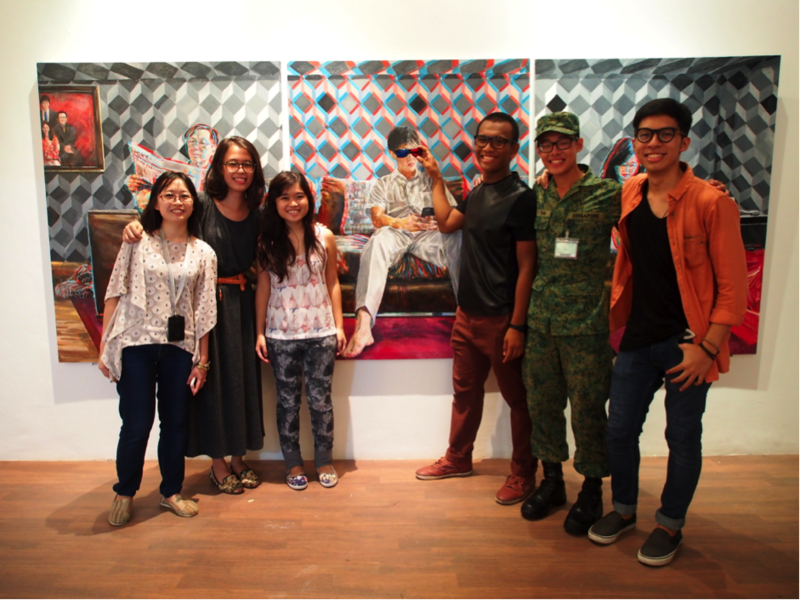 Four of ten exhibiting artists, and their teachers. Left to right: Ms Amanda Poh, Miss Julie Lee, Seet Yun Teng, Ahmad Nazaruddin, Tan Yan Yong, William Batara Jeremiah Samosir.